InfoSpec, Inc. is the Education Provider for this course. This class is registered with the Registered Continued Education Program (RECP). The class offers Professional Development Hour(s) (PDH) to RECP Members. This class is registered with the Interior Design Continuing Education Council (IDCEC). The class offers Professional Development Hour(s) (PDH) to IDCEC Members. In this program, we'll discuss accessibility and ADA compliance in restroom design. We'll identify who needs accessibility in the restroom. 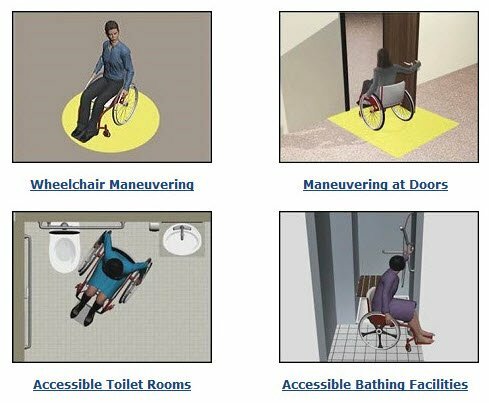 We'll also review the principles of universal design as well as proper placement of fixtures and accessories and clearances in accordance with code and ADA guidelines and requirements to ensure accessibility for all. Use fixture and accessory selection knowledge to improve toilet room accessibility for all users. How can we register a group of people attending the event from a single location that work with the same organization? One person from the organization needs to register for each location. At the time of the presentation, the webinar facilitator will ask each designated registrant of each group to record the roll call of those in attendance. Phone number is optional. The webinar provider may need to contact them if they encounter any problems with registration or email address. Your designated registrant needs to email the roll call list within 24 hours to our webinar provider; whose email address will be given at the end of the session. An overview of the types and use of emergency wash equipment, latest ANSI standards & requirements that affect design, and tepid water requirements for emergency equipment. Explain the importance of emergency eyewash and shower equipment in settings where users are exposed to hazardous substances. How can we register a group of people attending the event from a single location and working with the same organization? The designated registrant needs to email the roll call list within 24 hours to our webinar provider --whose email address will be given at the end of the session.